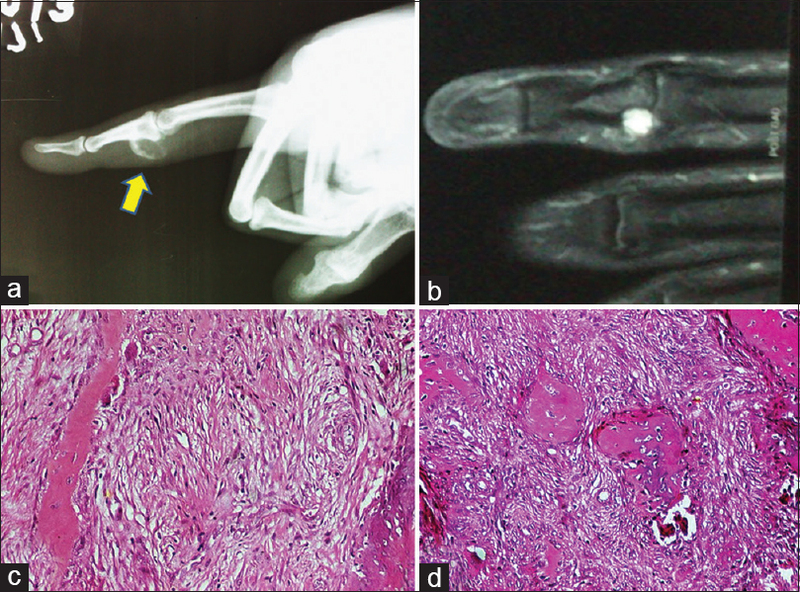 A 33-year-old male presented with a painful lesion in his index finger. He underwent radiologic imaging followed by a biopsy. Plain radiograph showed a well-defined lytic lesion, showing peripheral ossification, involving the base of the proximal phalanx, with adjacent soft tissues [Figure 1]a. Magnetic resonance imaging (MRI) showed a well-defined punched out, mostly a soft tissue lesion, measuring 13 mm × 9.6 mm × 7.5 mm, involving the ventromedial aspect of base of the proximal phalanx. The lesion seemed expanding the volar cortex of the phalanx, scalloping the intact inner cortex, with a well-circumscribed soft tissue extension. It was heterogeneously hyperintense on T2-weighted image (T2WI), fat sat proton density (FSPD) and short tau inversion recovery (STIR) images and isointense on T1WI [Figure 1]b. The radiologic differentials were giant cell tumor and enchondroma protuberans. Which category of tumors this entity comes under? What is the recently described genetic event driving these group of tumors? (1) Solitary fibrous tumor. (2) CD34 and STAT6. (3) Low risk. Solitary fibrous tumor (SFT) is defined as mesenchymal tumor of fibroblastic origin, which invariably displays a prominent hemangiopericytoma-like growth pattern and is composed of CD34-positive fibroblastic cells. The earlier term “hemangiopericytoma” has been replaced by a SFT. This tumor can occur at any body site, although commonly identified in the thoracic (pleural-based), head and neck, and other soft tissue sites. While most SFTs display CD34 immunoexpression, certain cases might be negative. Moreover, CD34 positivity is seen in other tumors, such as a dermatofibrosarcoma protuberans, spindle cell lipoma; certain cases of gastrointestinal stromal tumor and nerve sheath tumors, which constitute as differential diagnoses of SFT in various locations. Synovial sarcoma and malignant peripheral nerve sheath tumors constitute as its other differentials. Although most SFTs are benign (unless classified as malignant), their behavior can be unpredictable. Therefore, a model of risk stratification has been proposed for SFTs. On that basis, the present case is low risk. Therefore, the patient has not been recommended any adjuvant therapy and is recommended a follow-up. Fletcher CD, Bridge JA, Lee JC. Extrapleural solitary fibrous tumour. In: Fletcher CD, Bridge JA, Hogendoorn PC, Mertens F, editors. World Health Organization Classification of Tumours of Soft Tissue and Bone. Lyon: IARC Press; 2013. p. 80-2. Doyle LA, Vivero M, Fletcher CD, Mertens F, Hornick JL. Nuclear expression of STAT6 distinguishes solitary fibrous tumor from histologic mimics. Mod Pathol 2014;27:390-5. Robinson DR, Wu YM, Kalyana-Sundaram S, Cao X, Lonigro RJ, Sung YS, et al. Identification of recurrent NAB2-STAT6 gene fusions in solitary fibrous tumor by integrative sequencing. Nat Genet 2013;45:180-5. Demicco EG, Park MS, Araujo DM, Fox PS, Bassett RL, Pollock RE, et al. Solitary fibrous tumor: A clinicopathological study of 110 cases and proposed risk assessment model. Mod Pathol 2012;25:1298-306.